Approximate Dimensions: 8" x 4" x 1"
Very popular graduation present teases the recipient to unlock the surprise within. 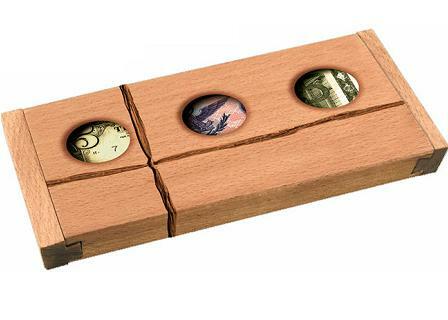 Gifts of paper money, certificates, sports and concert tickets or coupons are placed inside the wooden puzzle. 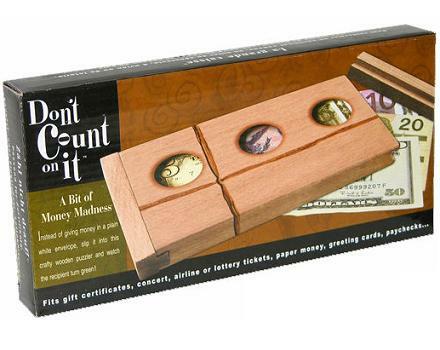 Don't Count on It is a creative replacement to the standard paper envelope for any occasion. Included : 1 wooden puzzle and solution. Note: Holes are an illustration on the wooden box. The wood is not actually 'see through'.